A sharp rise in hikers climbing some of the region’s highest mountains leads to the degradation of natural resources and raises a variety of other issues. 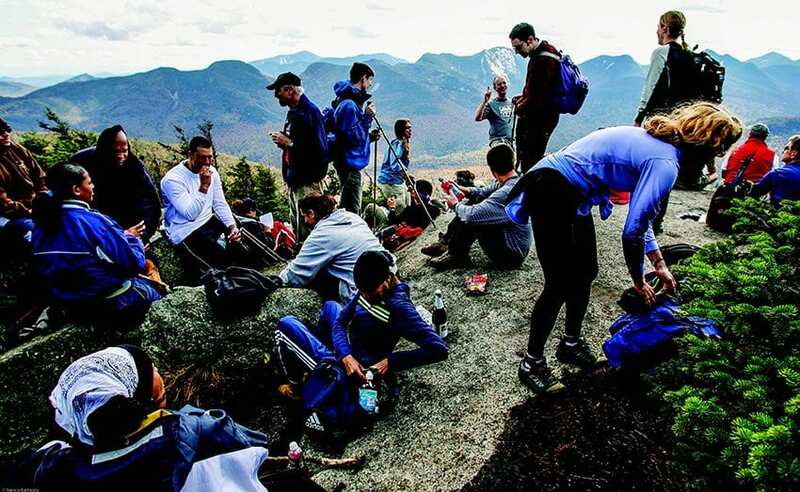 The number of hikers in the High Peaks has been steadily increasing in recent years, especially near Lake Placid and Keene Valley, raising concerns about safety and degradation of natural resources. Located along Route 73, Cascade Mountain is one of the easiest and most accessible of the High Peaks to climb. Pitchoff Mountain, while not a High Peak, also is popular and rises just across the highway. On a busy weekend, it’s not unusual to see dozens of cars lining the narrow road and large numbers of hikers on both summits. State Department of Environmental Conservation statistics show the number of hikers signing the register at Cascade each year more than doubled over the past decade—from 16,091 in 2006 to 33,149 in 2015. Much of the jump occurred over the past five years. On weekends and holidays, hundreds of people may climb Cascade on the same day. On the Sunday of the Labor Day weekend in 2015, the summit steward reported coming into contact with 540 people. Adirondack Mountain Club Education Director Julia Goren, who oversees the summit- steward program, said it’s good news that hiking numbers are up because people who enjoy the outdoors are more likely to become conservation-minded later in life, but the increase is happening faster than expected. “You need to have people have direct experience [of the outdoors], but on the other hand, you need to manage the population, and I don’t think that anyone is quite ready for the numbers of people who show up,” Goren said. 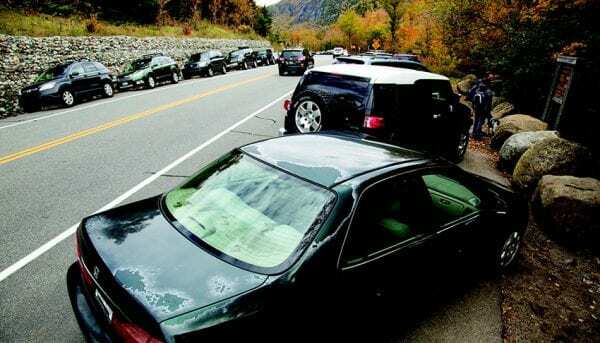 The high number of cars lining Route 73 at popular trailheads has raised safety concerns. 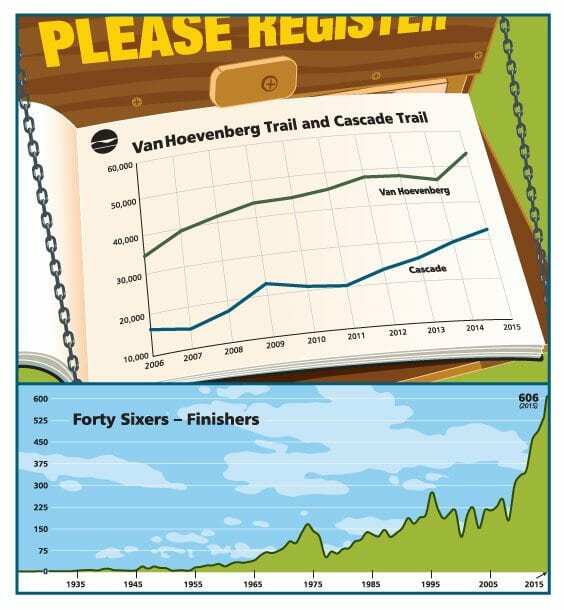 Cascade isn’t the only trail seeing steadily rising usage. The Van Hoevenberg Trail, which starts near Adirondak Loj, is perhaps the most popular trail in the Park. It leads to Mount Marcy and is used to reach other destinations in the eastern High Peaks. Last year, 53,423 people signed the trail register—a 62 percent increase from 2005. Although that’s a steep rise, the 2015 number is only 6,486 higher than the 1998 number. Visitation in the eastern High Peaks decreased in the early 2000s after the state Department of Environmental Conservation enacted regulations in 1999 that, among other things, limited the size of hiking groups and prohibited fires. The recent increase in hikers mirrors regional trends. Hiking challenges play a part. In New Hampshire’s White Mountains, the number of people hiking the four-thousand-footers rose from 330 in 2010 to 529 in 2015—a 60 percent jump. Likewise, the number of hikers climbing the forty-six High Peaks in the Adirondacks also has increased dramatically (see sidebar). Neil Woodworth, ADK’s executive director, said numbers in the High Peaks are way up partly because the state has been marketing the Lake Placid region as part of Governor Andrew Cuomo’s initiative to increase tourism in the Adirondacks. The Regional Office of Sustainable Tourism (ROOST), which is based in Lake Placid, says hiking is by far the most popular outdoor activity of people who visit the Adirondacks. ROOST Executive Director Jim McKenna said the non-profit organization already promotes other areas of the Park such as Hamilton County and Tupper Lake. McKenna also pointed out that most visitors to the LakePlacid.com website are looking for short hikes, not hikes in the High Peaks—although interest in all hiking content has been way up in recent years. Big Slide is another popular High Peak. Woodworth and others fear that the increased traffic will diminish the hiking experience, because of the crowds and the chatter of people talking among themselves or on cell phones. “It’s degrading the experience when you have large numbers of people on a relatively small peak area,” said Woodworth. Woodworth is also concerned about damage to natural resources. Many trails in the High Peaks are severely rutted, partly because of the foot traffic and partly because of poor trail design. Old trails such as the one on Cascade go straight up the mountain because they followed paths created by guides and early explorers looking for the shortest route. Connor said DEC and its contractors employ modern trail-building techniques when rebuilding old trails or constructing new ones. Examples of rebuilt trails can be found on Jay, Hurricane, and Lyon mountains. Another growing problem is that hikers often fail to heed Leave No Trace principles that aim to minimize human impacts in the wild. For example, hikers have cut trees on summits to improve views. Connor said this was done on Nippletop and Lower Wolf Jaw in the last three years. “There was some branch cutting in the past, but we’re seeing actual tree cutting,” Connor said. Human waste and trash also are issues. The woods near the summit of Cascade are littered with toilet paper and female hygiene products. Similar problems have been reported on other mountains and near trailheads. The Ausable River Association has installed privies at busy trailheads. The waste issue motivated DEC to take the unusual step of installing box privies high on Cascade last fall. 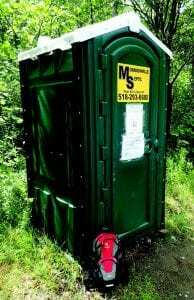 The department plans to install privies on other peaks as well, including one at about four thousand feet on Marcy. “Historically, we haven’t put privies up there because of the [shallow] soils,” Connor said. ADK’s Goren said many visitors are relatively new to hiking and lack backcountry skills. Surveys by the Wildlife Conservation Society in 2003 found that one-third of the hikers in the eastern High Peaks were novices or visiting the High Peaks for the first time. “We assume that’s pretty consistently true [every year],” Goren said. Hikers’ inexperience may also partly explain a rise in search-and-rescue missions. In 2006, DEC forest rangers rescued fifty-three people in the greater High Peaks region, which includes the Giant Mountain, Dix Mountain, Sentinel Range, and McKenzie Mountain Wilderness Areas. In 2015, that number jumped to one hundred people (including ninety-three hikers). “We definitely see more and more people who don’t have maps, who have never looked at the guidebook, who are navigating off their phone, or have taken a picture of a map and then are trying to use that printout for navigation purposes,” Goren said. Additional efforts are being made to prepare hikers for the backcountry. DEC is upgrading its website to contain more educational material, and the Adirondack Forty-Sixers plan to station volunteers at the Cascade trailhead to talk to hikers. These initiatives will supplement the ongoing efforts by DEC’s rangers and Adirondack Mountain Club to educate backcountry users. Safety has become an issue at popular trailheads where parking areas often overflow, especially along Route 73 near Giant and Cascade, where vehicles frequently line both sides of the road. Connor said DEC recognizes the problem. “Parking lots overfill, people line both sides of the road, people are crossing with traffic coming through,” he said. Connor said DEC plans to meet with officials from towns, police agencies, and the state Department of Transportation to come up with solutions. One idea is to move parking areas to stretches of road where drivers have a longer line of sight. Keene Supervisor Bill Ferebee said he would welcome an initiative by the state to address the parking problem. In the last few years, he said, hikers have taken to parking on side streets in Keene Valley when trailhead lots are full. Adirondack Forty-Sixers each year has skyrocketed in the past decade. The Adirondack Forty-Sixers organization has seen a record number of people joining its ranks in recent years. Started in 1925, the club now has 9,425 members—more than a third of whom joined over the last ten years. The club is open to hikers who have climbed its list of forty-six High Peaks, most of which top four thousand feet. It has seen a record number of new members each year since 2009. Last year, 606 hikers joined. Forty-Sixers President Brian Hoody said the club hasn’t done much to market itself. He suspects the rise in membership reflects a general interest in hiking-oriented clubs. The club has always put a value on outdoor education and trail work, and Hoody said it is trying to make sure that new members heed Leave No Trace principles to protect natural resources in the backcountry. The club is updating its website and posting educational links on its Facebook page. It also plans to station volunteers at the Cascade Mountain trailhead—and possibly others—in the near future to educate hikers. Fran Shumway, an at-large director of the club, said the trailhead volunteers will work in cooperation with summit stewards. They will teach hikers about rules and regulations, make sure they’re prepared, and remind them to carry their trash out of the woods. “People need to leave things the way they found them, or better than they found them,” Shumway said. 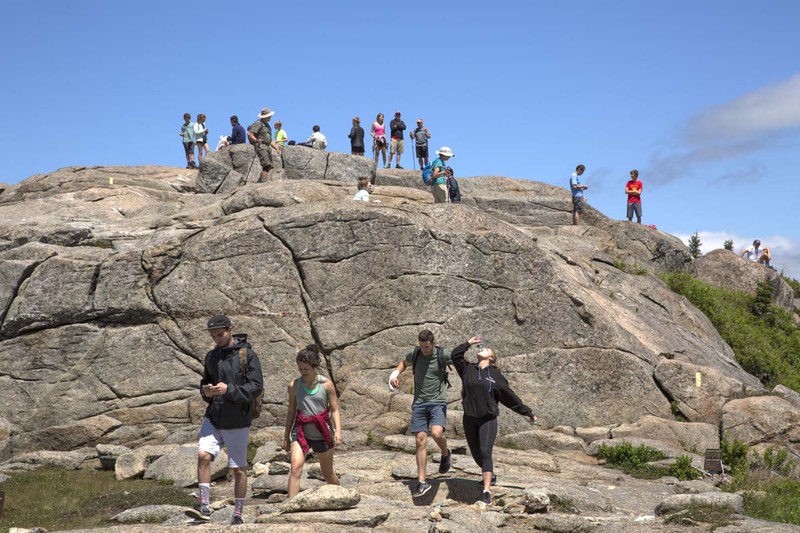 A consequence of the increased interest in hiking all of the High Peaks is that herd paths on the so-called trail-less peaks are seeing more foot traffic. The herd paths are not marked, but Forty-Sixer volunteers maintain them. Hoody said parts of some paths, such as those on Seymour and Cliff, need to be rerouted. The club also plans to meet with the state Department of Environmental Conservation to discuss erosion near the summit of Panther Mountain, one of the trail-less peaks. The list of the forty-six High Peaks dates back to the club’s founding. At that time, it was thought all exceeded four thousand feet. Later surveys found that four of the peaks are below that altitude. In addition, one peak not on the list was found to reach four thousand feet. The club, however, sticks with its traditional list. Trap Dike has grown in popularity as a result of online trip reports. Getting information to visitors of the Adirondack Park has always been a challenge for the state Department of Environmental Conservation. Unlike other state and national parks, the Adirondack Park lacks an entrance facility where visitors can pick up brochures, maps, or other handouts. In the past, recreational users relied on local visitor centers, guidebooks and maps, guides and outfitters, and word-of-mouth for ideas on where to go and what to do. It took time to plan a trip. That changed with the rise of the internet. Now information can be found in just seconds or minutes from websites and social-media outlets such as Facebook, Twitter, and Instagram. The information explosion has had a number of impacts. One of them is that people are going to places that in the past saw few visitors. For example, DEC Forester Tate Connor says the herd path between Gray Peak and Mount Marcy sees more and more hikers even though DEC has tried to discourage its use. Adirondack Mountain Club Education Director Julia Goren said that while it’s good that more people are becoming interested in the Adirondacks, it’s troublesome that some are getting information from unreliable sources that don’t promote wilderness ethics or properly explain the dangers of adventures they are promoting. 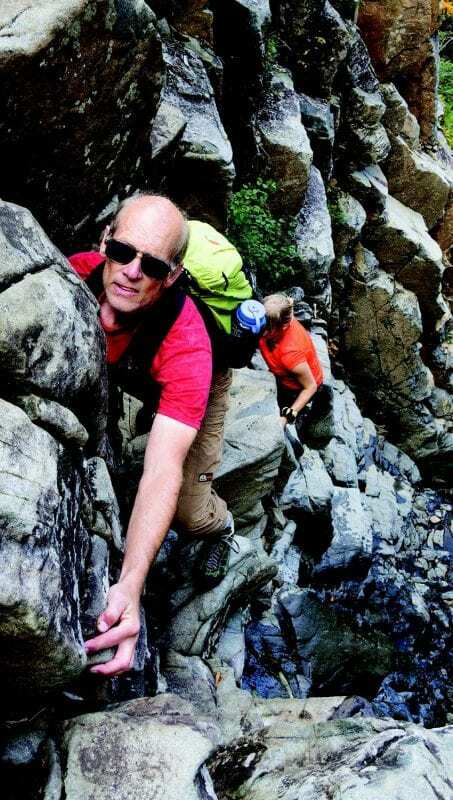 On one weekend day this past July, Goren said, the summit stewards on Mount Colden reported that more people ascended the mountain via the Trap Dike—a steep, narrow canyon where a slip could result in death—than the traditional hiking trail. Goren said most were not prepared for such an outing. DEC spokesman Dave Winchell said another problem is that many groups that organize hikes via the internet aren’t aware of the Park rules and often break the group-size limit (fifteen for a day hike). I say incentives should be given to the tour companies that bring bus loads of would be explorers from down state and other areas. Push them to help spread the knowledge that Forty-Sixers and the SDK Club used to be able to spread by themselves!! This is an excellent article. I enjoy hiking and I love the Adirondacks. Luckily for me and my work schedule my days off are on Monday and Tuesdays so I normally hike when there are no crowds which I like. I made the sad mistake of hiking Hadley Mountain one year on Memorial Day, and I will NEVER hike on a holiday again. People on their phones, kids screaming and yelling (don’t get me wrong I am glad to see kids out hiking, but the parents need to teach some manners). I have seen groups of kids hiking with one bottle of water, wearing jeans and flip flops. I have seen young kids dragging a cooler up Black Mountain and drinking on the trail. I’m not saying don’t enjoy the hike, but people have to be smart. The article talks about people not having a map, or proper gear. If you want to keep the numbers down and help preserve the land one thing I think needs to happen is to have a DEC officer at every major trail head, have him/her at the register, and if people aren’t properly prepared then TURN THEM AWAY. Make people become responsible and it will cut down on search and rescue cost. I am not saying have them at every trail head, just the ones that are becoming more popular and easy to get to. Even when I go on my day hikes I have a map of the area, compass, chem lights, head lamp, change of clothes, extra food, survival knife, waterproof matches…etc. It may seem like overkill, and thank god I have never been in a situation where I needed to rely on my survival skills, but if the day ever comes then I will be ready. At the minimum hikers should be wearing a good pair of hiking boots, they should NOT be wearing anything cotton, they should have a map of the area and a compass AND KNOW HOW TO USE IT!!!! BE PREPARED and BE SAFE. If you haven’t read “AT THE MERCY OF THE MOUNTAINS” then I would suggest that for all you novice hikers out there. I climbed Marcy and a few other high peaks in the mid to late 70s. I remember waiting in a line at the summit and there was barely room to sit. The camping area at marcy dam was like being in a DEC campsite in Lake George. I remember having trouble parking near Giant Mtn trailhead. I wore cotton shirts, jean shorts and work boots! I had kids and got into other things and hadn’t hiked in high Peaks in 30 years. Started up again this summer and although parking was very crowded did one day hikes to Big Slide and one to Algonquin. Hard to do now at 60 and there were some crowds but I started layer in day and summit visits were peaceful. I drove past Cascade parking each time it looked crazy. My husband and I climbed Cascade Mt. It was surprisingly clean. Considering the number of people I saw on the trail it was Saturday 8/27/16. We have been hiking together for at least 51 years, and we have never seen the trails so crowed. Hiking is very good for the health, but something has to be done about the crowds. I usually hike during the week. We especially like hiking the Long Path. No we have not finished it we only have about 10 miles more, but we must camp overnight and can’t do that anymore. Wish it was easier to climb Cornell Mt. Glad to see the state is thinking about more even development of access in the Park, I think that’s a huge part of it. The only places with real tourism infrastructure and access are Lake Placid and Lake George, which leads to overuse of those areas and economic deprivation in a lot of the rest of the region. The summit trail on Lyon Mountain is as lovely as anything in the 46, but the only people who use it are locals in the north area of the park and people coming down from Canada. I think the shorter-term solution would be not relying on community transmission of outdoor knowledge about proper gear and survival – which is exclusive, and parks are for everyone. Instead, it seems like the APA/DEC should develop and investing in new trailhead signage for the the most popular routes that explains the risks and rules. I was lucky enough to learn about hiking and outdoor survival within my family and at summer camp. I “earned” my first real pair of hiking boots after successfully hiking Giant, Algonquin, and Marcy with my dad and sister, and learned the 10 essentials and how to build a fire etc. with an outdoor educator on backpacking trips near Lake George. But we can’t blame people for a lack of knowledge if they’ve never had access to similar experiences. Having a literal gate-keeper at trailheads to turn people away like a bouncer is also exclusive, but it seems to me that well-designed and placed signs stating the nature of certain trails, the gear recommended before hiking, and rules – not littering, not pooping near water sources or without burying it and WHY, as well as alternate routes if something less challenging is available – would be a great place to start. That is a great idea but you’re also expecting people to stop and read these signs. I have seen tourists just blaze by reg. boxes near the Allen Mt. trailhead or out near the Sewards-not easy hikes. People are still coming down Cascade/Porter in JEANS despite the 46er volunteers at the trailhead warning them against such behavior. When unchecked some people will do exactly what they want when it is convenient to them and it is those that ruin it for others. To think it won’t happen and that by putting up a sign is going to curb all this behavior is nieve. I live in the ADK’s and I have only climbed Cascade twice. It’s just not worth dealing with these amounts of tourists. And you’re acting like exclusivity is a bad thing. WRONG. In the right circumstances it improves the experience of those hiking. Look at Kahtadin. Parking exclusivity works for them. If you were serious about hiking that mountain, then plan accordingly, otherwise take your jeans and flip flops elsewhere.